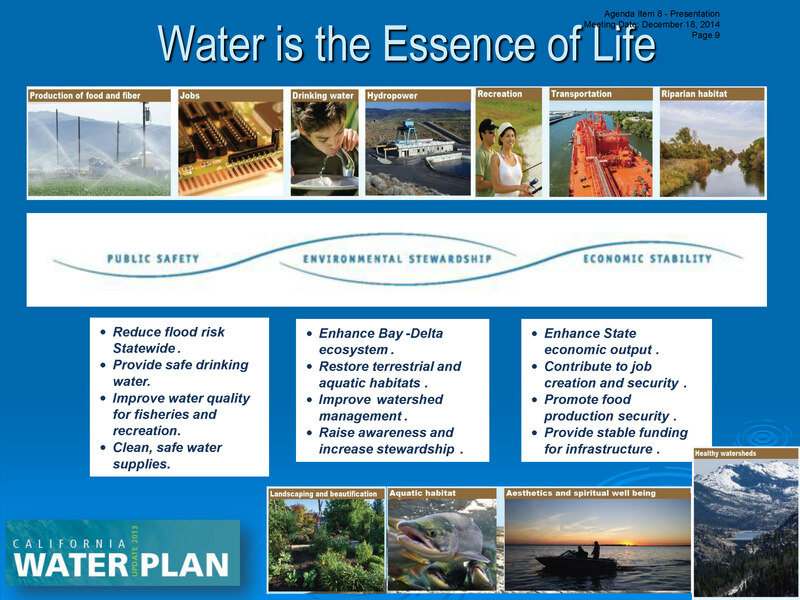 At the December meeting of the Delta Stewardship Council, Council members were given an overview on the latest iteration of the California Water Plan, the statewide planning effort for managing California’s water resources that is led by the Department of Water Resources. 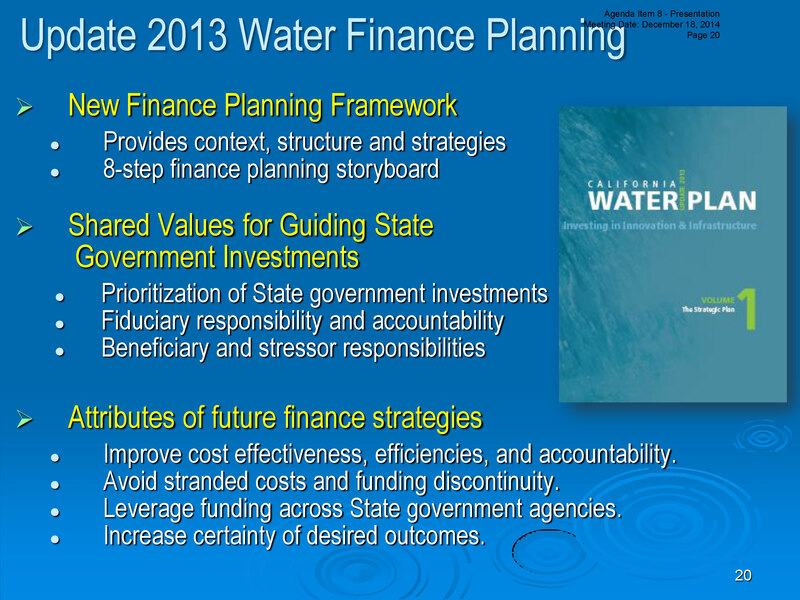 The California Water Plan presents the status and trends of the state’s water resources, supplies, and demands for a range of plausible future scenarios, and thus provides a collaborative planning framework for officials, agencies, tribes, resource managers and the interested public to develop findings and recommendations and to make informed decisions for California’s water future. 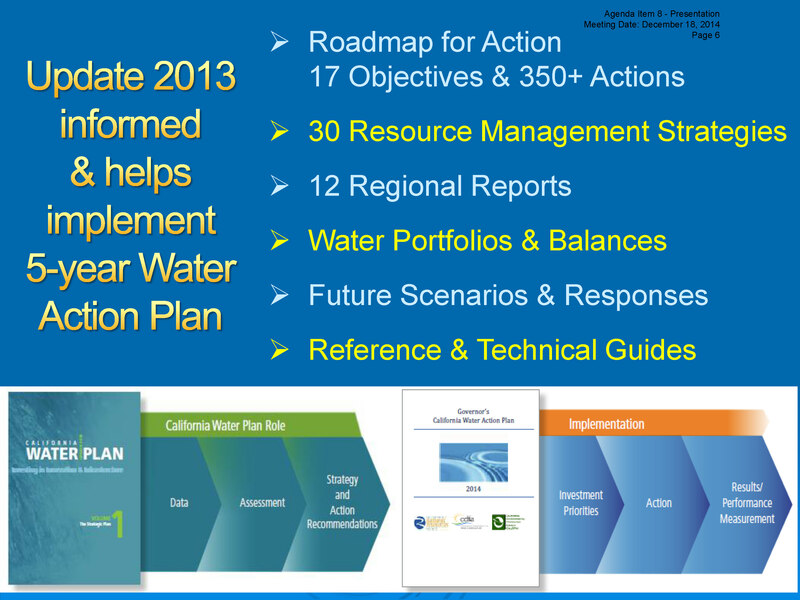 The first California Water Plan was produced in 1957, and it has been updated every five years with the most recent iteration, Update 2013, released at the end of October of last year. 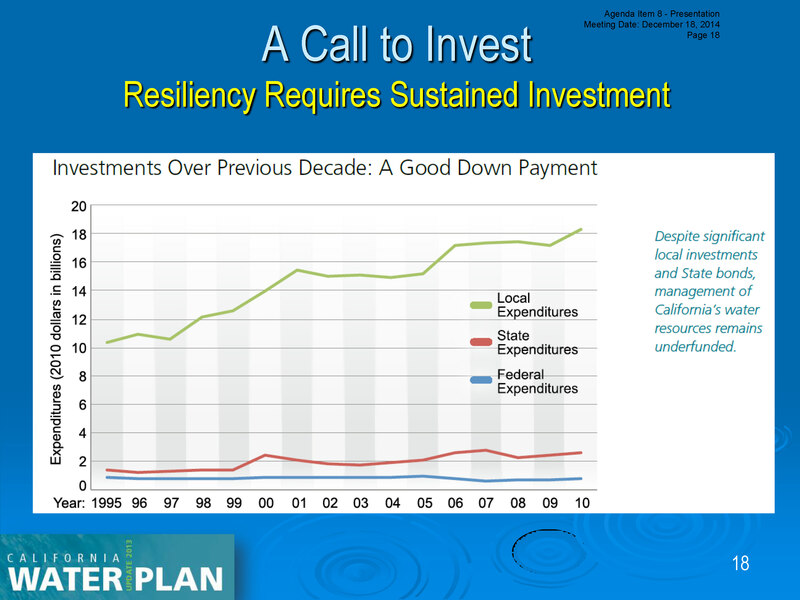 Mr. Samsam then turned it over to Kamyar Guivetchi to present an overview of the California Water Plan. Kamyar Guivetchi began by noting that he has been employed at the Department of Water Resources since 1978; his first job was working in the town at Hood on what was then the fish screen testing facilities for the intakes for the peripheral canal. “Little did I know back then what this all meant, but now I can piece that all together,” he said. 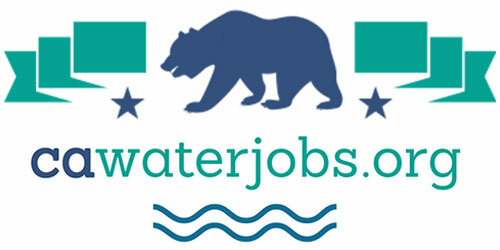 “When I brief folks, I basically say, ‘if you want to know what state government is doing in water for the next five years, read the Water Action Plan,’” he said. “While it’s only 19 pages, because it is a multi-agency administration initiative, it is organizing the work of our agencies as well as our budget requests and our resource allocation. 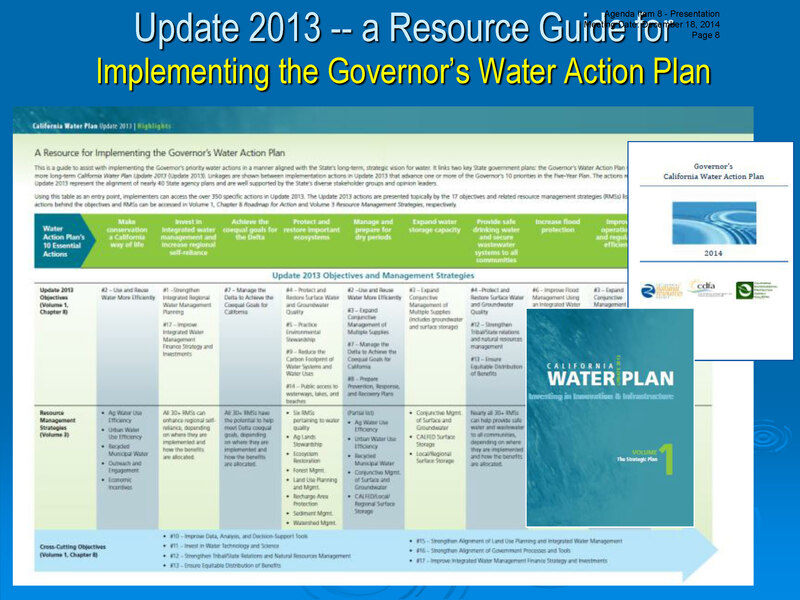 The work of state government is being organized around the Water Action Plan, and the reason that works is because the ten actions of the action plan are very comprehensive.” He noted that although every administration has had some sort of water initiative, this is by far the most comprehensive he has seen during his tenure at DWR. 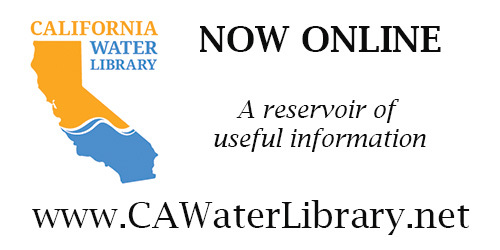 The California Water Plan in total is over 3500 pages long; it is organized into different volumes based on intended readership, Mr. Guivetchi explained. The first volume is the strategic plan, or the “Roadmap for Action’; there is also a volume of Resource Management Strategies and 12 regional reports, one of which focuses on the Delta. He noted that there are also water portfolios and balances, future scenarios, and a lot of supporting reference and technical information included in the plan. Invest in innovation and infrastructure. We need to invest in innovation and infrastructure, he said. 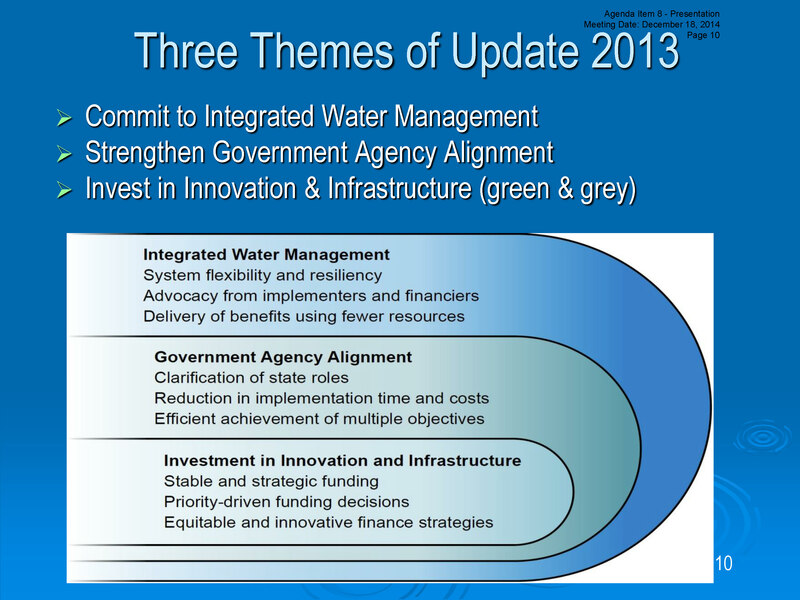 “By innovation we mean finding ways to improve governance of water, finding ways to improve planning and public engagement, finding ways to improve agency alignment, as well as improve information technology. How can we do a better job of collecting data, managing data, exchanging data, and using those data in analytical tools.” We need to consider ways to commercialize and make more effective new technologies, he added. We also need to invest in infrastructure, both the green infrastructure such as improving watersheds, ecosystems and floodplains, as well as human and gray infrastructure at multiple scales, he said. “The state has a responsibility and a role to invest in all of those innovation activities and to cost-share in the infrastructure activities,” he said. Mr. Guivetchi pointed out that the innovation activities are in the hundreds of millions of dollars while the infrastructure costs are in the hundreds of billions of dollars, yet when push comes to shove, the funding for the innovation activities are the first to go. 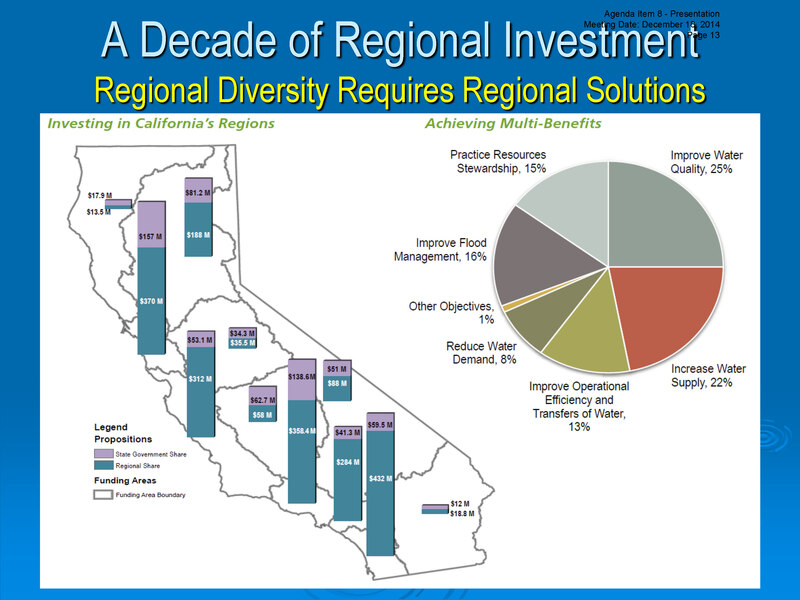 “What we’re trying to advance in this water plan is that if the state even unilaterally were to invest in those innovation activities, it will provide a windfall to make better infrastructure decisions at the local and regional level,” he said. Objective 7: Manage the Delta as both a critically important hub of the California water system and as California’s most valuable estuary and wetland ecosystem; achieve the two coequal goals of providing a more reliable water supply for California and protecting, restoring, and enhancing the Delta ecosystem in a manner that protects and enhances the unique cultural, recreational, natural resource, and agricultural values of the Delta as an evolving place. 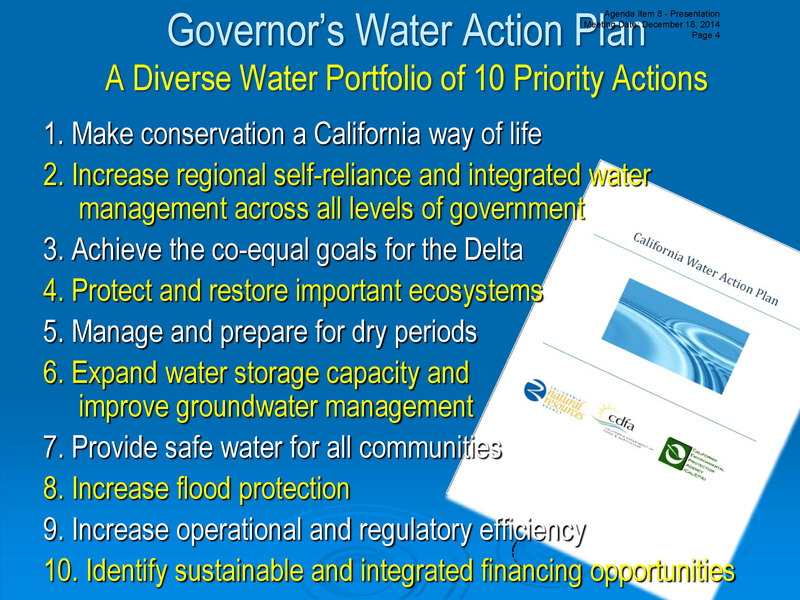 Mr. Guivetchi noted that this is a concise description of Delta Plan recommendations that were included in the California Water Plan. Objective 1: Strengthen integrated regional water management planning and implementation to maintain and enhance regional water management partnerships and improve regional self-reliance. Objective 3: Advance and expand conjunctive management of multiple water supply sources with existing and new surface and groundwater storage to prepare for future droughts, floods, and climate change. “A big part of the water plan is promoting conjunctive water management,” he said. “Groundwater with multiple other supply sources, just not stored surface water, but surface runoff, recycled water, stormwater capture. Conjunctive water management can be an effective management tool.” He noted that the Sustainable Groundwater Management Act is consistent with the water plan’s recommendations for conjunctive groundwater management. Objective 4: Protect and restore surface water and groundwater quality to safeguard public and environmental health and secure California’s water supplies for beneficial uses. 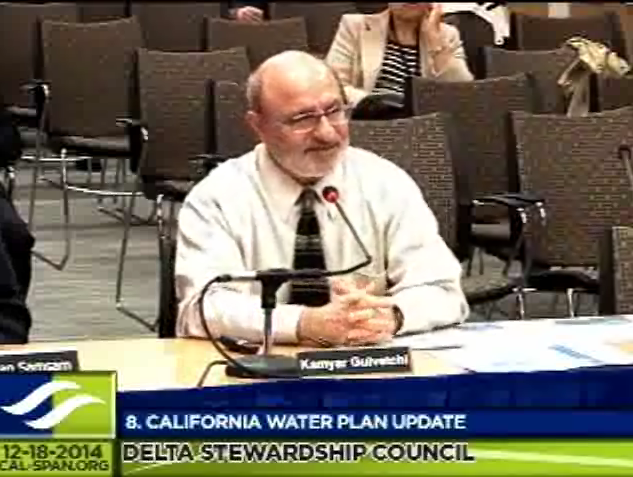 Mr. Guivetchi noted that the water plan’s recommendations are consistent with the Delta Plan’s. Objective 5: Practice, promote, improve, & expand environmental stewardship to protect biological diversity and sustain natural water & flood management systems in watersheds, on floodplains, & in aquatic habitats. Mr. Guivetchi said that they worked with Fish & Wildlife and others with to come up with the related actions. Objective 6: Promote & practice flood management that reduces flood risk to people & property and maintains & enhances natural floodplain functions using an Integrated Water Management approach. 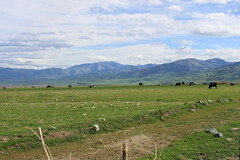 He noted that both the Flood Future report and the Central Valley Flood Protection Plan are companion plans to the California Water Plan, and recommendations were drawn from them. 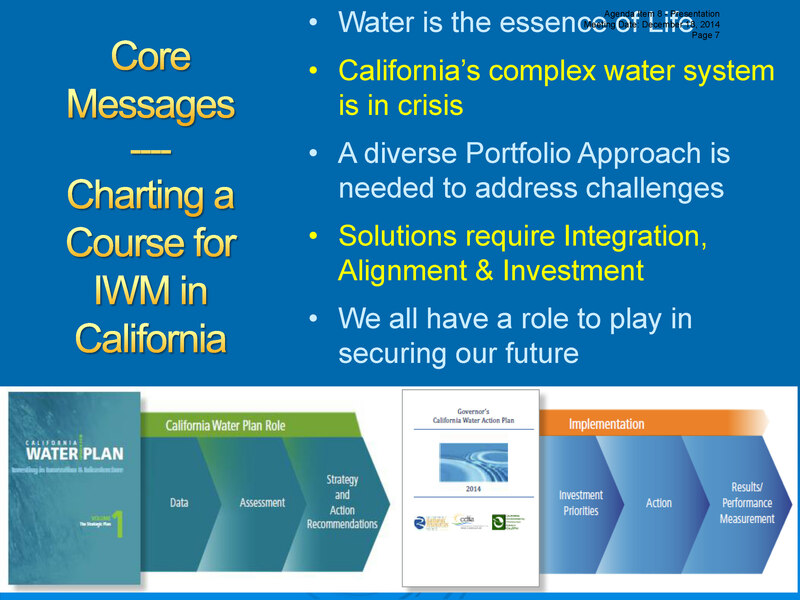 He then presented a slide with the 30+ Resource Management Strategies contained in the California Water Plan. 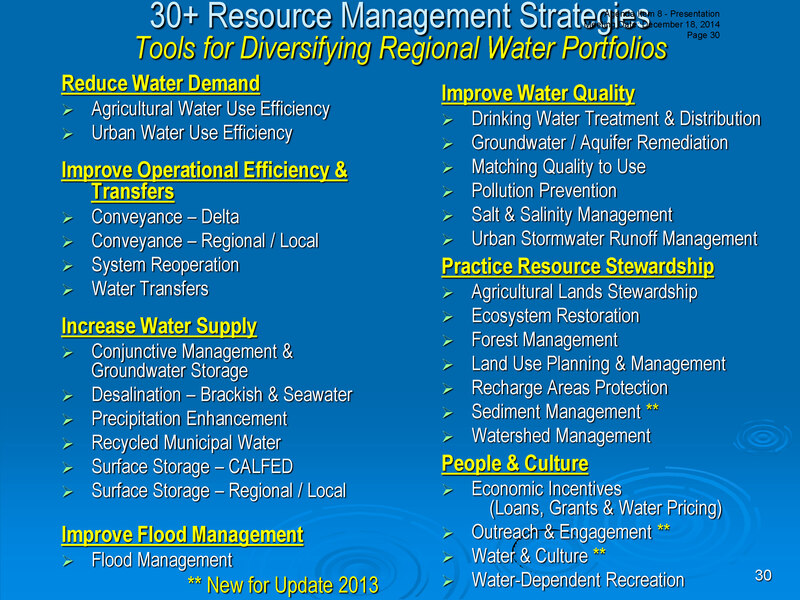 Resource Management Strategies are techniques, programs, or policies that can help local agencies and governments manage their water and related resources. Implementation recommendations and challenges for each RMS is outlined in a chapter written by subject matter experts and vetted through the public process. 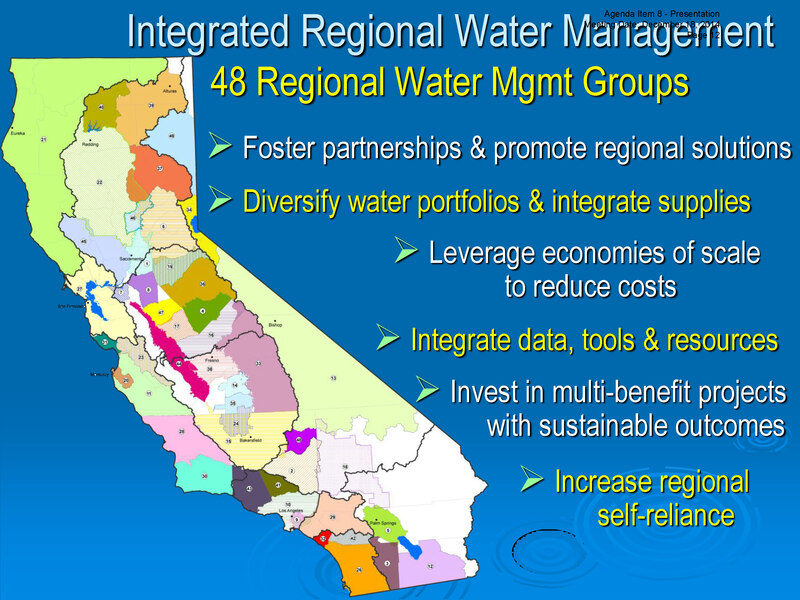 “This is the tool box of integrated water management,” he said. 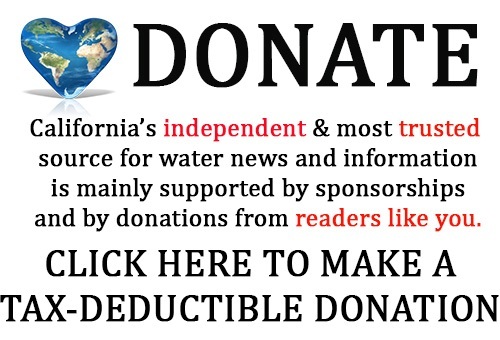 Mr. Guivetchi closed by encouraging everyone to subscribe to the Water Plan E-news. For Kamyar Guivetchi’s power point presentation, click here.